Multi-talented Caryl Parry Jones – composer, singer, script writer – is one of Wales' foremost all round entertainers. Originally from Flintshire, Caryl was born to a musical family and grew up in a creative atmosphere, which most certainly shaped her career. Caryl started composing songs at 14 years of age for the singing group she performed with 'SIDAN'. Caryl was also the vocal arranger which is a skill she has honed over the years and close harmony is a true passion of hers. Caryl is a member of acclaimed a capella group 'The 405s' which delights in singing arrangements of the old American standards as well as their own brand of luscious arrangements of well-loved Welsh songs. Caryl's solo singing and television careers began in the 80s. She became a presenter of children's programmes and soon became a firm favourite with the Welsh public. There followed numerous tv programmes both as presenter and singer. Caryl co-presented BBC's 'Radio Cymru Breakfast Show' for several years and still has her own show. Caryl is also a regular on various tv programmes, BBC Radio Wales and other radio programmes. Caryl appears regularly in gigs where she performs her own material as well as arrangements of more familiar songs and mixes the music with her own brand of comedy - from large scale concerts to house gigs - and always to an enthusiastic and warm reception. Caryl is also in demand as an after dinner speaker, host and adjudicator - her warmth, story telling skills and outlook on life making her a popular choice with audiences of all kinds. For special engagements, she will write a song on the background of the event and the people attending. Caryl developed her comedy and scriptwriting skills over the years, creating comedy characters for the numerous series to which she put her name. She contiunes to do this and the "Caryl" series, which gained extraordiany popularity in the mid 80s, was relaunched in 2013. Caryl depicts various characters of her own invention and they have proved to be exceptionally popular with her audience. She is currently working on a drama comedy for S4C which she has co-written with her cousin, Non Parry and she appears as one of the characters. Songwriting is one of the most important facets of Caryl's creativity. She has written literally hundreds of songs over the years in a variety of genres - from children to choirs, from ensemble pieces to solos - and is thrilled to do so whenever the opportunity (or inspiration) arises. She has had the pleasure of writing for a number of artists including Bryn Terfel and tenor, Rhys Meirion. 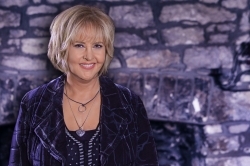 Caryl Parry Jones has released 5 albums of her own, written many musicals, including the highly claimed TV musical film, "Y Dyn Na'th Ddwyn y Dolig" as well as countless songs for tv shows and films. Composing and music is her lifeblood. Caryl's talent as a wordsmith is also well known with poetry, lyrics and song translations into and from English being an important part of her career. In 2007 she was appointed Welsh Children's Laureate - a post which lasted a year and saw Caryl travelling the length and breadth of Wales encouraging children of all ages to write poetry under her enthusiastic guidence. Scriptwriting is another string to her bow. She has scripted several sit coms, childrens' tv shows as well as the ever popular films "Ibiza Ibiza" and "Steddfod Steddfod" in which she played multiple characters. The creation of her comedy chracters which depict Welsh people from all walks of life and from different areas around Wales, coupled with her mastery of accents, is seen and one of her many triumphs. She co-wrote the UK BAFTA winning "Rhestr Nadolig Wil" in 2008 - a film which has won the hearts of the Welsh audience and is repeated regularly at Christmas time. One of Caryl's latest ventures has been the writing and composing for "Grand Slam - The Musical" - an adaptation of the classic Welsh film for musical theatre. Following a very successful Research and Development performance, plans are being made to develop the show further with a view to tour in the near future. By her own admission, Caryl's greatest achievement is being a Mam to her five children. For the past few years, the family get together and hold a series of Christmas concerts for charity under the name of The Parry Isaacs. They are memorable evenings which put everyone in the Christmas spirit with a mixture of old favourite and original Yuletide songs.